Henry Kippin was the last of three generations of local people who swept the chimneys of Hampstead for over a hundred years. He was born at 3 Perrins Court, now occupied by the Villa Bianca Italian restaurant. 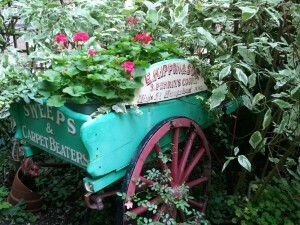 His father’s handcart is preserved in the garden of Burgh House. Henry’s family moved to Portsmouth, where he died. 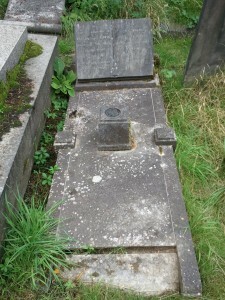 He is buried with his wife Ellen. What do we know about Henry Kippin and his ancestors? The Kippin family was an ordinary Hampstead family. They were not famous, and so it is more difficult to find things out about them. But we can discover quite a lot. Henry, his grandfather (also called Henry), his father Edwin and his uncle John were all sweeps living and working in Hampstead. Being a chimney sweep in Victorian times was not a popular trade because it was dirty and unpleasant, and this didn’t change very much even with the introduction of vacuum cleaners in the 20th century. It was mainly people who were born into the trade who became sweeps. Grandfather Henry was born in Mitcham, Surrey, and in 1841 was a journeyman sweep (that is, an employee who was fully trained, rather than an apprentice who was learning the job), working for a man called Josiah Bowden who lived in the Vale of Health. Henry married in 1842 and set up his own business, living in Holly Hill with his wife and one employee. As their family grew they moved to Yorkshire Grey Yard (see page on the Town Improvement Scheme for a map of old Hampstead to find all these places). By 1881 his two sons, John and Edwin, were both established as sweeps in Hampstead. John and his family lived in Willow Terrace, and Edwin and his family lived in Perrins Court. Edwin had five children, including young Henry, and continued working into his 60s. Unlike his younger brothers, our Henry became a sweep working for his father, and married Nellie, a cook in a house in Carlingford Road, in summer 1903. (Perhaps she worked for one of his customers, and he met her when he swept their chimneys?) They had two children and, by 1911, were all living at New Buildings, Flask Walk. There is a memorial there to all the residents who fought in the first World War. It shows that Henry volunteered and joined an AA Corps. After the war he returned to Hampstead and to his old trade, retiring after the second World War. After Nellie died in 1957, Henry went to live with his son in Portsmouth. This was the end of the family tradition – over 100 years of sweeping chimneys in Hampstead. We don’t know if the Kippins used climbing boys in the earlier years. Most sweeps did until it became illegal, which happened before our Henry was born. You can see the cart that Edwin used to carry his brushes at Burgh House (there is a picture of it on this page), and note the other services that he offered to his customers. In Charles Dickens’s Oliver Twist a particularly vicious chimney sweep called Gamfield wants to take Oliver as an apprentice. You can link to a copy of ‘Oliver Twist’ through this link to Project Gutenberg – http://www.gutenberg.org/files/730/730-h/730-h.htm. Use Ctrl F and enter ‘Gamfield’ to get references in the book to the sweep. Perhaps the most famous children’s story about a climbing boy is Charles Kingsley’s story of Tom in ‘The Water Babies’ which can also be read via Project Gutenberg – http://www.gutenberg.org/dirs/etext97/wtrbs10h.htm. This html version doesn’t have page numbers but up to the end of what is the first twenty pages of the book (when Tom looks in the bedroom mirror and sees how dirty he is) there is a good description of the life of a climbing boy. Henry Mayhew (1861-2), ‘London labour and the London poor: volume 2’ (London: Frank Cass & Co) has information about chimney sweeps in the 19th century. You can read this book online via the Tufts University Digital Library. There is also information on-line about Children and chimneys. As far as I can see, Henry’s wife died in Hampstead in 1957. Henry was my great uncle although he died when I was just born. Originally the name was Kippen but changed during Edmund’s (not Edwin!) lifetime for some reason or other. I was very much surprised and pleased by the wonderful work done and would like to say thank you and good luck with your future projects. I have done quite a bit of research into my family history, but I seem to have missed Henry and the Hampstead branch. Fascinating.